The British Army recruits approximately 300 individuals every year. In order to apply you must be Nepalese (Nepalese birth certificate) and live in Nepal. Applicants will be called forward by District and Nagar/Gawn Palika (according to your NPP). The dates for your district will be published on the British Army website. On arrival your documents will be checked (see documents section). If your documents meet the requirement, you must state whether you wish to join the BA or GCSPF. You will be issued with either a pink registration form (GCSPF) or a white registration form (British Army). You can see an example of these on the right hand side of this page. Our Recruiting Staff will assist you in filling out this form. Here is a video demonstrating the new physical tests for Recruit Intake 20. 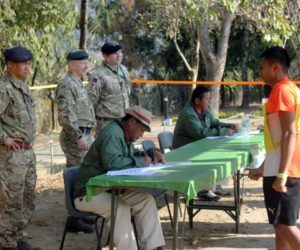 To find out more about joining the Brigade of Gurkhas please visit the British Army website.